Coal Camp USA is a web site dedicated to coal mining. If you have coal in your bloodline you will enjoy this site. The Connellsville Field is featured, along with some great photos of the area. The photo to the left shows some of the Lemont patch homes. Click here to see all the Lemont pictures. The Coal and Coke Heritage Center The Coal and Coke Heritage Center is back online after being out of service for a while. 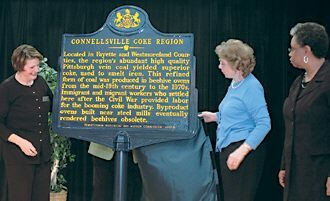 Sponsored by Penn State Fayette Campus, this site is dedicated to preserving the history of the Connellsville Coke Region. (Photo used with permission). A historical marker honoring those who worked long hours underground, mining coal, was dedicated during a ceremony at Penn State Fayette, The Eberly Campus. is a directory of sites with content appropriate for research about Appalachian history, culture, physical and social environments, social customs, and images and stereotypes. It also includes links to bibliographies, organizations, events and other gateways focusing on Appalachia. Take the time to visit this web site for a great learning experience.